Bryce knew what it was like to see his child suffer through cancer treatment. So although his daughter Kate finished her treatment and left the hospital, he kept returning to support other families who weren't so lucky. ARLINGTON, Va. — Bryce Heavner pushes a colorful cart filled with toys, snacks and books through the hallways of the Inova Fairfax Children’s hospital in Northern Virginia. The fruit snacks, puzzles, pajama sets and crackers bring smiles to the kids and families staying at the hospital. On one floor, the young patients are tiny NICU babies. On another, they’re kids battling blood conditions and various types of cancer. Stressed and anxious parents occupy both. The halls are familiar to Bryce. He doesn’t balk at the patients’ gaunt faces or accompanying tubes, bags and bandages. When knocking on doors to offer his treats, he knows to knock loudly enough to alert the parents who might need a bottle of water or some pretzels, but not so loud that it might wake a child who was up all night. He understands because not so long before, Bryce was in their shoes. About two years ago, he paced the hospital floors as his daughter, Kate, received treatment. Kate was first diagnosed with cancer when she was 11. She initially complained of back pain, so doctors sent her to physical therapy, thinking she might have pulled a muscle while swimming. But when the pain persisted, the Heavners realized it might be something more serious. Doctors eventually found a tumor in her back and determined it was cancerous. Because the tumor was in her spinal cord, it was considered a rare form of brain cancer known as a primitive neuroectodermal tumor. Kate began treatment immediately. Bryce, a stay-at-home dad, made the hours-long drive with Kate regularly from their home in Arlington to Baltimore, Md. for her radiation treatment. She underwent chemotherapy at a hospital closer to their home. It was there that the family first encountered the Ronald McDonald House Charities and their services. At the Inova Fairfax Children's Hospital, the organization maintains a “family room” as a resource for parents and families. Volunteers in the family room provide snacks, computers and coffee for parents and push a cart around the hospital hallways distributing toys and games to young patients. “Distractions were great for her, and it was great for us as parents to be able to go to the room and just get a cup of coffee and stretch our legs,” Bryce said. Finally, in May 2017, Kate completed her last round of chemo. But as her regular visits to the hospital ended, Bryce thought about the families who remained and how he could help them. He also hoped to replace negative memories of his family’s time at the hospital with some positive ones. “I wanted to see what little bit I could do to help other people going through the same stuff. It’s hard to explain to someone who hasn’t gone through the cancer experience,” Bryce said. So he began as a volunteer, helping out a few days a week. For Kate, it was special to see her dad giving back to kids like her. “He’s making people’s days like every day he goes there, pushing around a cart and giving out toys, and from a kid’s perspective, that’s like the best thing ever,” Kate said. 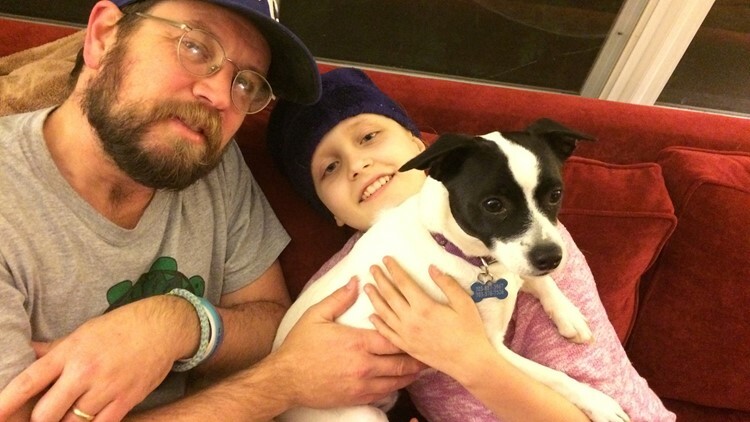 In September 2018, Kate’s scans came back clear. She will continue to have scans to monitor her health, but she’s back in school and doing well. Recently, Bryce also got some good news—he was promoted to volunteer coordinator at the family room. In the new role, he will oversee volunteers at Inova Fairfax and make sure the rooms are stocked with all the snacks and toys the families might need. Because if anyone knows how much it can help, it’s Bryce.